A unique enchanting experience that will transport you to old times. 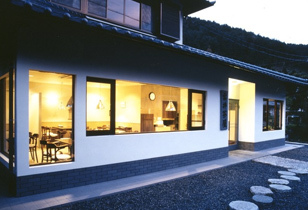 Our accommodation is an old traditional Japanese inn, in a tranquil and historic countryside. From Kyoto station, it takes an hour to reach this countryside called Ohara, in the northern part of Kyoto city. We strive to keep the feel-at-home and comfortable atmosphere of the old times in our inn. and we do not promise the convenient facilities that those accommodations offer. guests helping themselves and staff being around to help when called upon. listen to sounds of nature and feel the fresh air as you soak into the hot spa and relax your body and mind. Oohara no sato is surrounded by nature, this might mean some new unexpected guests such as ants, moths and mosquitoes. If any of our guests happen to wander near you, please come to our front desk and we will assist you. Minshukus are known for their affordability compared to hotels and Ryokans. In order to keep our prices reasonable for our guests, rice and miso soup are self-serve. As well as the laying out of your futons ( we will lay out one of our guests futons for each party as an example ). 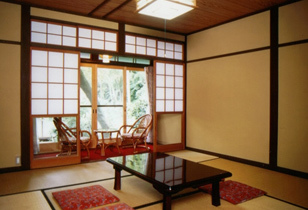 All of our guest rooms are traditional Japanese-style tatami rooms. Except for a few, most rooms share bath and bathrooms. In our location, the cold wind from the sea can sometimes be felt during winter. We offer extra heaters for the comfort of our guests at the front desk. One of the attributes that sets us apart from the big city, are our traditional Hot pot dishes. Experience the difference between our dishes and Kaiseki (multiple course) cuisine. Our hot pots are made from local and unique ingredients that are hard to find even in Kyoto. Experience the taste of the countryside at the birthplace of the miso hot pot. 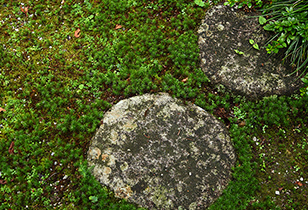 Arranged by our award winning gardener for his work at Kinkakuji ( Golden Pavilion ). Our garden is different than the logically constructed gardens in Kyoto. We embrace nature’s imperfections such as broken twigs and branches when arranging our garden. The vegetation around the open air baths is also maintained by our award winning gardener. Misoan was featured in Otona no osharetecho Magazine. Our popular product Shionou-Sansho was featured in the October 2014 issue of Serai Magazine. Misoan was featured in Randonnee Magazine. Kumoidiya was featured in Hanako Magazine No.1049. considered to have beneficial health effects. because of its slightly alkaline, Sodium, Hydrogen carbonate ion. 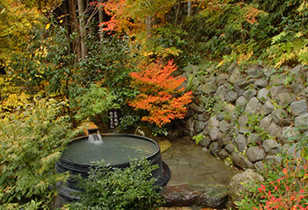 The source of our hot spring is located 1175 meters under the North East Kyoto Basin. Its temperature is 27.9 degrees Celsius and the flow rate is 120 l/min. In Japan, waters with a Radon content of 30 ( x10-10 curie/kg ) are known as hot waters for the ailing. 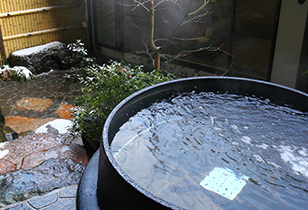 A study by Kouda Corporation rated our waters radon content at 25 ( x10-10 curie/kg ) ), making us one of the few hot spring in the Kinki region with such a high rating. 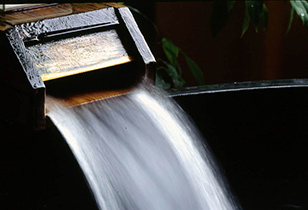 Our waters are clear and colorless and cause less irritation while still maintaining a high concentration of minerals. You will feel a light breeze on your softer and smoother skin after enjoying a relaxing bath in our waters. *Our waters is heated by a closed circuit system. Please refrain from drinking. The left image contains more information on the elements contained in our water. Feel free to contact us if you have any questions. Our Rotengoemonburo has a diameter of 4 meters and can accommodate an average of 4 people. Goemonburo or cauldron bath is a type of traditional Japanese bath in which a “cauldron” filled with water is heated over direct fire. In consideration for our guests, our bath is maintained at a constant temperature via a circulator system. We hope you enjoy the nature and the beautiful scenery while taking a relaxing baths in our Rotengoemonburo. You can book a stay with us using one of the services below. If you wish to use paypal, let us know by contacting us using this form. Our local specialty. Enjoy a warm homey hot pot. Made with more than 3 kinds of home-made miso ( Miso is a fermented spice made of soybeans and Koji ( malted rice ) ), local vegetables and local chickens ( Kyoakajidori ). A vegetarian option is also available upon request. Our Vegetarian friends favorite. A special miso blend mixed in the soymilk broth bring out extra flavor and richness. We hope you enjoy the soft texture of this healthy hot pot. Accompanied by Tempura and Nimono. Cook beautifully marbled Kyoto beef in our miso base stock, enjoy it melts into the stock. 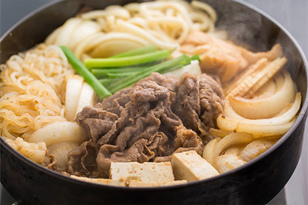 Other traditional Sukiyaki ingredients include konjac, onions, green onions, tofu and udon. Raw eggs also available upon request. with home-made miso from our sister store Misoan. Misoan is located between the mountains on the edge of the Kamo river. It has been producing miso for a 100 years. Their subtle craftsmen carefully produce miso with traditional techniques and without the involvement of machinery. 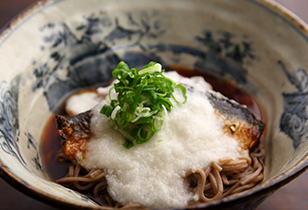 Located in Jakkoin street, Misoan specializes in traditionally made miso. The miso is processed carefully in our warehouse, using fresh local beans and water plus Hakata salt. Their spicy miso is fermented for a year while their mild variety is fermented for two. Other popular items are their Shibazuke. 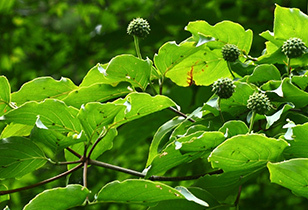 Hanasansho also known as Japanese Pepper is also available for a limited time during spring. Please take a look at their online store. We recommend their miso hot pot. A healthy home-made, free of additives, miso stock, local chickens and vegetables. Accompany this with a cup of locally harvested tea. Ohagi, a sweet made of rice and azuki and Yomogi Mochi (mugwort mochi) are also available in spring for a limited time. Our guest rooms are simple Japanese style rooms, where you can enjoy the seasonal views of spring cherry blossoms, summer greens, autumnal tints or the winter scenery. A Cooler, heater and TV are also included. 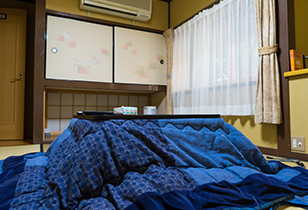 During winter, Oohara is quite cold, so we provide you with a Kotatsu. If you need more heating equipments, feel free to let us know. Our soothing alkaline hot spring is said to be good for the following conditions,Nerve pain, Sore muscles, Joint pain, Frozen shoulder, Motor paralysis, Stiff joints, Bruises, Sprains, Chronic digestive diseases, Hemorrhoids, Improving blood circulation, Recovering from illnesses. Large and medium open air baths ( GoemonRotenburo ). Air conditioner, food court, cafeteria, party room, conference room, hot spring, large bath, Rotenburo, sake vending machine, projector. ・The trip from Kyoto Station to Oohara takes approximately 1 hour by bus. 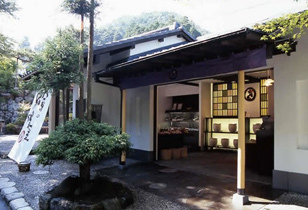 ・We offer a shuttle service from the Oohara bus station to the inn. Please give us a call upon reaching it. A public phone is available at the station in case you do not have access to a cell phone. We appreciate your patience as the driver might not be immediately available at all times. 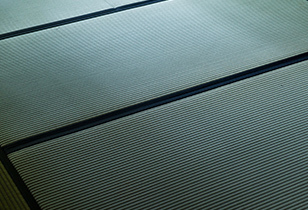 ・This site offers a helpful guide from Kyoto station. 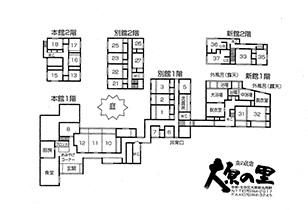 ・We’d like to emphasize to all of our guests that most of our baths and toilets are shared. Our Inn’s self service style is part of the experience. Guests are responsible for laying out their own futons, but we will always lay down one for you as an example to follow during your stay. We hope you enjoy this unique experience. 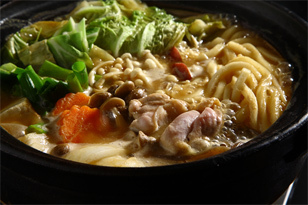 ・We specialize in traditional hot pot dishes instead of Kaiseki cuisine. 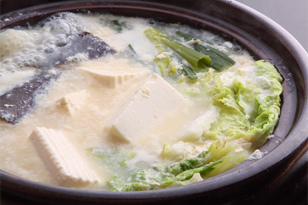 We offer a vegetable miso hot pot and tofu hot pot for our vegetarian guests. Sukiyaki, Shabu Shabu, Tempura and Sashimi are also available for an additional fee. 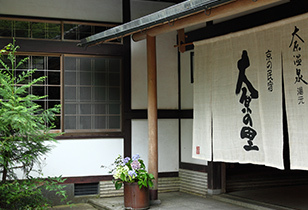 ・Tattoos are allowed in our baths but we ask they remain covered with a towel for the comfort of our Japanese guests. Swimsuits are allowed in cases where you cannot expose skin for religious or cultural reasons. ・We strive to provide an authentic traditional Japanese experience, this might conflict with guests that expect the commodities of a hotel such as central AC. We hope that this won’t deter you and you will allow us to provide you a unique authentic experience. ・We are located right next to the mountain. You might see some insects.